My interest in wind farms and birds had led me to wanting to answer some fundamental questions about avian collisions with wind farms, power lines and turbines. Much of this work is inspired by and in collaboration with Prof Graham Martin. 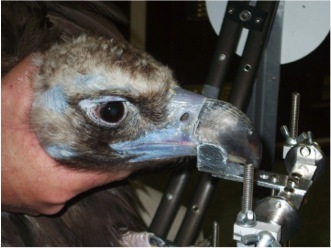 Recent work has involved the beginnings of an investigation into the susceptibility of vultures and other large raptors to such collisions with man-made objects. A recent paper, in collaboration with Prof Graham Martin (University of Birmingham) and The Hawk Conservancy Trust (Hampshire) published in Ibis, ascertained why certain species groups of vultures frequently fall victim to turbines and power lines and others apparently not at all. The main finding was that vulture species that are frequently killed in such interactions are essentially blind to their forward travel. 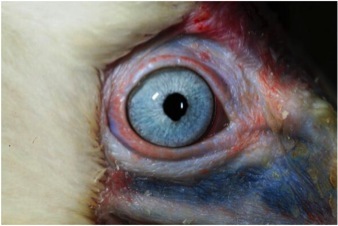 This susceptibility is due to a combination of a small visual field, large brow ridges and the behavioural trait of looking down when flying. 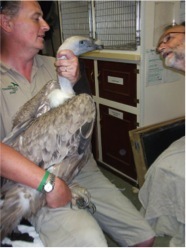 This suggests these vultures have reached a limit as to what is possible in the sense of propensity to change, and they will not be able to overcome the sensory challenges posed by large man-made structures being placed in their flight path where no natural structure would be present. 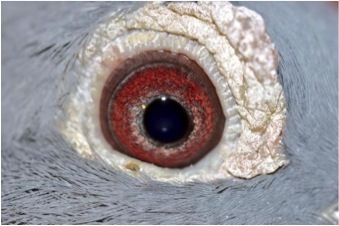 Measuring visual fields doesn’t harm the birds. They sit in the dark with their bill resting on a small metal platform, while you walk around them shining a light into their eyes to assess, via retinal light-back, where they can see and where they can’t see. From this you can measure blind spots, and where binocularity is present (read more here).